What do you know about LOCKED-IN SYNDROME? The locked-in syndrome (LIS) is a catastrophic condition caused most often by ischemic stroke (infarct) or hemorrhage, affecting the brainstem. A patient suffering from LIS is aware but cannot move or communicate verbally due to complete paralysis of nearly all voluntary muscles in the body except for vertical eye movements and blinking. There is no specific treatment for locked-in syndrome. Depending upon the cause, a person may recover, although complete recovery is highly unusual (one such recovery is Kate Allatt from Sheffield, South Yorkshire.) Most patients with this syndrome do not recover although they may learn to communicate using eye movements. Imagine yourself on the moon, an echo of silence surrounds you like the cold bitterly embraces you, everything begins to ache, you become stiff from the cold and can no longer move. You are trapped under a pitch – black sky, you try to scream, and nothing comes out, any sound at all, no one is there to understand you or your pain. Trapped! How would YOU handle this situation? 90% of those with this condition die within the first four months. This story is about 1 of those that belong to the 10%. Alexandre Dumas provided one of the earliest descriptions of LIS in “The Count of Monte Cristo” by vividly depicting a character who was “a corpse with living eyes.” Following a stroke, Monsignor Noirtier de Villefort could only communicate by raising, closing, or winking his eyes. Not many have heard of LIS until the book “The Diving Bell and the Butterfly” (also released as a movie) by journalist Jean-Dominique Bauby (editor-in-chief of French ‘Elle’) 1997 was published in 1997. I recently heard the story of another Finn on the Positive Psychology Facebook Group (30K+ members). 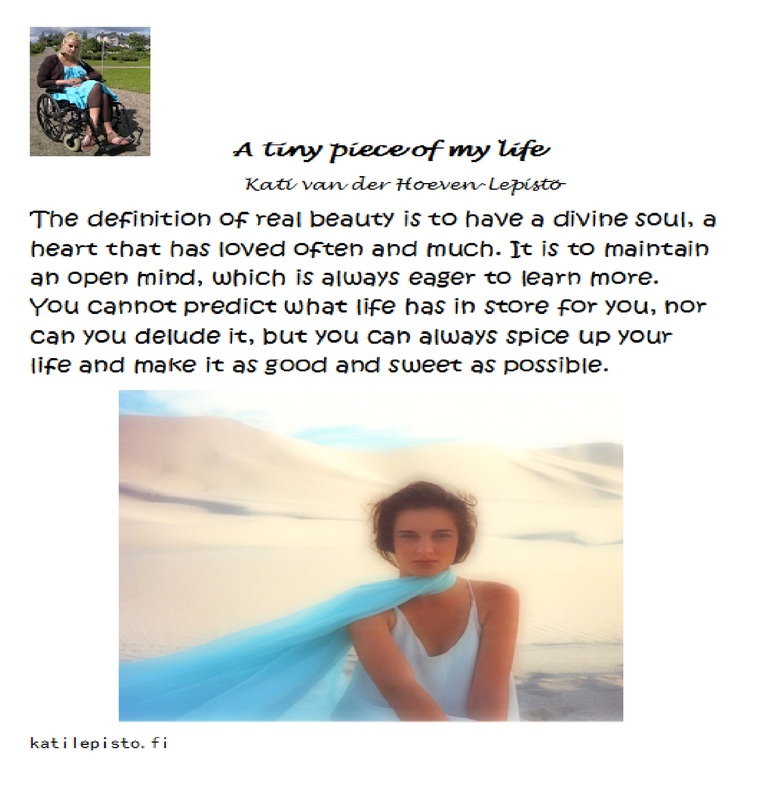 About 20 years ago, Kati van der Hoeven, a former Finnish supermodel, lost her ability to move and speak. Since that time, she’s become a leading advocate for people with Locked-In Syndrome and other conditions using an eye-to-computer system to manage her writing. For this story, I communicated with Kati via Facebook Messenger, marveling the speed with which she is able to correspond. Is it the Finn in Kati, or something else? 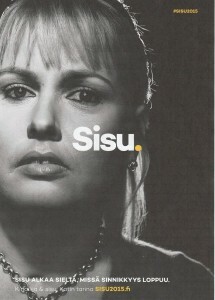 Not sure, but I think I got a better understanding – and appreciation — of sisu. The Finnish author, blogger Kati van der Hoeven-Lepistö, is the award-winner ´The Finnish young achiever of the year 2014´. The prize was awarded by the junior division of the Chamber of Commerce International Finland. Kati van der Hoeven-Lepistö is a 40-year-old former supermodel, whose career was cut short after an afflicted brain stem infarction in 1995. Kati was 20-years-old at that time, Kati lost the power of movement and the power of speech completely. Only her eyes are working, and she communicates with a letter chart. The grand assemblage of instruments according to van der Hoeven is determination, faith, and toughness, these enable her to live a full life. She has helped and encouraged others to cope with being paralyzed and moving forward. Kati is the author of her life experiences in the book ´Blink of an eye´ (only in Finnish), and she is an active blogger. According to the jury, van der Hoeven-Lepistö fosters a positive attitude to life, and she has affected thousands of people’s life and attitude towards life by teaching acceptance of diversity and understanding (spiritual growth). The Young Achiever is the world’s most prestigious award, the junior division Chamber of Commerce International Finland to share their field and in his own right performing between 18 and 40 years of Finnish citizens. Competition is the national implementation of international ´The Outstanding Young Person Awards´. Our marriage is not a traditional one. We are born in different parts of the world. In other words, different cultures (not to forget the language). Different religions. We don’t share the same skin tone, color of eyes nor color or type of hair. I guess that you can say that we are an; International, intercultural, inter-religious, an interracial couple with a ten years’ age difference. Moreover: HE is in perfect health, and SHE is almost entirely paralyzed (cannot speak either). You might think that the odds are against us. However, marriage is not a game of odds. Marriage is like karma; what you put in, is what you get out. 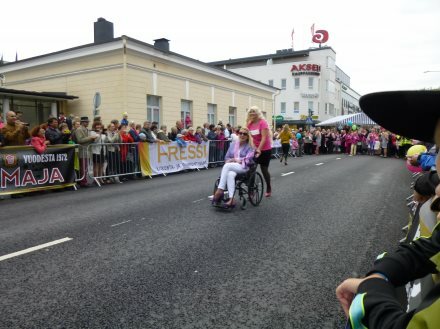 A young and upcoming Finnish model who was left paralyzed after a stroke shares her life experiences in her blogs. Kati is a true (SISU) inspirational model who shows that through pure determination, faith, and perseverance anyone can make the best of their lives and live it to its fullest. Whether you care for the disabled or are physically disabled yourself — Whether you struggle against illness or watch as another close to you struggles — If ever you’ve searched for a story of perseverance, love, and joy when happily-ever-after meets real life, Kati’s story is for you. In life, we are each dealt a deck of cards, and depending on how we choose to play them, life turns out… Wonderfully. Kati was a young international model when, at 21, she had a stroke which left her Locked-In. Paralyzed and unable to speak, Kati had to learn how to communicate with her eyes and with her heart. Today, some twenty years later, she tells her story of pain, adversity, and hope, a unique story that will touch your heart and help you to overcome whatever odds you might face. The power of hope, the power of love, the power of laughter all converge in this book to encourage us to face each hurdle as a challenge to make us stronger. This is Kati’s story and it can be your story too. Kati tells her story to author Sarah Tun, in the hope that readers around the world will share in her love of life and her gift of laughter, knowing that everything can be overcome with heart, patience, perseverance, and hope. You can ﬁnd Sarah Tun on her Website or LinkedIn. Kati’s vlog; Who is Kati? Kati’s life is a beautiful ode to human resilience.